Published on Wednesday, May 9, 2018. Elisa Iturbe And we cannot remember a time before capitalism. Which did exist. Dante Furioso Or a time of public housing. EI Or a time of public housing! Since this exchange last summer, in pulp #21, we have hosted a variety of perspectives on housing and public housing: Matt O'Connor (#22) about designing housing for the Greater London Council, Ilka Ruby (#25) about collective living and Baugruppen today, and Will Sheridan, who reviewed a show on social housing at the Center for Architecture in New York (#44). But what is exactly is housing, anyway? Today's interview starts with that question, with Andreas Rumpfhuber, an architect and expert on one of today's most famous social housing systems, Vienna's. I talked to Dr. Rumpfhuber twice: first about his life and work, then focusing on housing. Working from our first conversation I wrote a short profile of him, which you will find at the end. Collages by Edward Wang. Images & Content from Michael Klein's essay, "The Order of Residential Living," in Andreas Rumpfhuber's book, "Modeling Vienna, real Fictions in Social Housing." Social housing in every neighborhood: the black indicates social housing projects, or 'Gemeindebau,' scattered across Vienna. The gray shows the historical 'Gründerzeit' city core. Credit: A spread from Rumpfhuber's book, "Modelling Vienna, Real Fictions in Social Housing." NK Where exactly does this idea, housing, come from? AR What we regard as housing comes out of industrialization: the moment when, in England, the industrialists understood that the workers also needed a place to recover, to reproduce, and on the next day once again be productive. From that moment comes the concept of housing, the same concept we use today. First, housing as an apartment building is something that emerged during the first industrial revolution. Finally, that housing is always part of the capitalistic system. So the workers must both work in the factories, and pay rent. That is my understanding of housing. NK And what is then the connection between housing and crises? AR Housing is always in a crisis. What is important for today - is less what happened a hundred years ago, for example at the origin of the Viennese housing model, but rather the radical change of our economy since the second world war. With automation, the introduction of calculating machines, and the new thought model of cybernetics, already in the 50s and 60s we thought we would only have to work 20 hours a week. There was already back then the idea that the machines would take over all tedious work. It was the birth of Leisure Society. The consequence was that the factory disappeared. Following Italian philosopher Mario Tronti, I use the term “Factory of Society” -- the former confined borders of the factory would disappear. And the factory would spill out into the city, into society. The whole city becoming a site for production. And when we realize that the factory disappears, and with it paid jobs, then, in my opinion, our concept of housing needs to change. And this is what interests me. How can we change housing - rethink housing? NK In this context, what makes housing in Vienna unique? AR Viennese housing is on many levels unique. First it is unique because, right after the end of the first world war, it was self-organized. Wild settlers led the way to what later became – in an adapted form – famous as “Red Vienna”. In the beginning there was no party involved. But architects like Adolf Loos, or Margarete Schütte-Lihotzky were very soon involved in these self-organized forms of settlements. 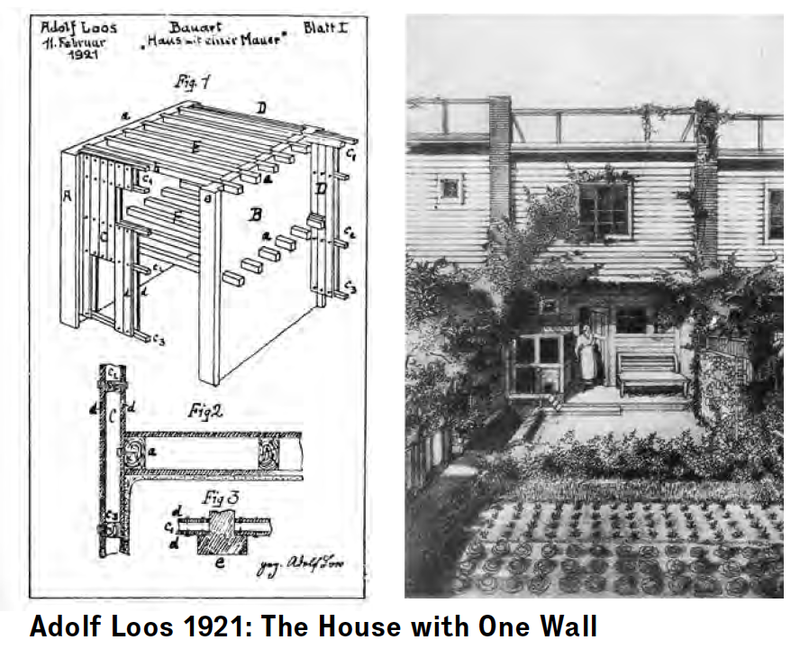 Architects chasing the wild settlers: an exercise in economy, Adolf Loos's 1921 "House with one Wall" foregrounds the garden, the basis for self sufficiency from which, Loos wrote, "every settlement proceeds." Second, with Red Vienna, the city built tens of thousands of social units, not just the infamous grand estates, the so-called Gemeindebauhöfe - such as Karl Marx Hof etc. - but also very pragmatic projects filling in gaps and distributing social housing across the entire city. And what that led to is that there is no neighborhood in Vienna without municipal housing. There is a great mixture. You were just as likely to find in social housing a parliamentarian or a barber or a painter. Finally, what is for today again important is that the city of Vienna was sufficiently clever in the 90s not to accept the dictates of the European Union, especially the Lisbon agreement. The order of the day was to sell everything that belongs to the state: real estate, property – and the city of Vienna, as opposed to, for example, Berlin - refused to sell off its communal housing. Instead the municipality introduced limited competition for publicly funded projects, significantly increasing the quality of new build housing projects. Today the municipality still owns around 23% municipal housing and manages about 21% of Vienna’s housing stock. Hence you have a somewhat absurd situation here, where publicly funded housing looks better and most often has better quality than privately funded housing. Its self organized origins, its integration into the city, and its resilience to liberalization are three aspects that make Vienna housing unique. NK Yet does Vienna public housing still stand in the cycle between factory and housing? AR Yes. In the course of the centuries, over which our economy, and with it housing, developed, housing became a self-fulfilling prophecy. The housing industry developed its own set of experts, specialists, suppliers, builders, architects, and developers and they have no idea how to build spaces of production. They cannot handle tenants other than people that actually dwell. So even though this discourse about mixed use is proceeding, we continue to build mono-functional housing. NK Is mixed use what you are advocating? AR Not really. It might be one aspect. But I am more interested in an intensified use of a building. Right now, when we talk about mixed use, then we have a space that is specified as commercial, and we have a space that is specified as communal, and we have a space that is specified for sleeping. What this produces are rooms that are not used. We have meeting rooms in office buildings, for example. Meeting rooms are 90 or 95% of the day not used. And this is a problem. I think we need to think of concepts and other forms of organizations that would allow for a different use of our infrastructure. This ultimately would also alter our understanding of ecology. NK What is the role of collective housing in Vienna? In these building groups there is a strong entrepreneurial spirit, especially in this moment. The other issue with Baugruppen is that at the moment they are very exclusive. Exclusive from a financial perspective, exclusive from an educational perspective, exclusive in that the process requires a great deal of time - time that many do not have. So how can we learn from these projects, and bring their advantages to a larger public? For those who have no time, who have less money - what can such a new model offer to them? What learning processes can we put into motion? I have similar doubts about google, facebook - these are neoliberal developments - but there are elements in them that are great. It would be so much easier to have city wide collective thinking. NK Given their counterparts, the factories, are transforming, do we need a new concept? Is it still helpful to concentrate on housing, per se? AR We might need a new word, as we need a new typology. The focus on housing is myopic - in Vienna, for instance, housing threatens all of the industrial areas. Because the building industry only wants to build housing. How can we work past housing to integrate industry and work into society? Andreas Rumpfhuber is an architect and theoretician in Vienna, and currently the guest professor for urban design as the TU Vienna. He studied in Graz as well as the Bartlett in London, and at SCI-Arc in Los Angeles. He studied at Graz with the Dutch urbanist Joost Meuwissen, and, after a few years of work, started his PhD in Copenhagen, a rare European program that pays its doctoral students. He found the focus there on phenomenology deadening: “Heidegger, Heidegger, Heidegger. Even Deleuze is being read in a very phenomenological way.” So when he had the chance to join a research program at Goldsmith at the University of London, under Eyal Weizmans, he took it. Today, the program there has developed into the research group Forensic Architecture, but back then, “it was my savior.” The participants met once a month for two days, across Europe. Each seminar began with one day discussing a prepared reading with an external guest - Keller Easterling, Pier Vittorio Aureli, and Juliane Rebentsich among them - and then on the second day the participants, all PhDs, would present their work. As most the students had practice based research, “The focus really – in looking back – was the question of methodology.” Andreas’ focus was on the architecture of immaterial labor, the transition from a Fordist to a post-Fordist production paradigm, when labor no longer produces physical objects, but instead communication. Andreas came back to Vienna after he and Jeremy Till wrote a research application about scarcity and creativity in the built environment. It was a huge project, they received a million euros from the European Union, and employed a team to analyze public housing in Vienna, as well as cases in London, Rekijavik and Oslo. The project was two fold: not just an analysis of the housing provision from the second world war until today, but also a speculation for future housing in Vienna. For those speculative scenarios, he invented an imaginary architecture collective, called ‘Blankspace’: "My problem was to be in the role of a researcher, as a scientist. And how are you able to become creative and design something? The strategy, to have an imaginary architecture collective, to say they are anonymous, they have done all these projects, and we – as researchers came across during their research allowed me to do the designs but also to reflect on them." At the end he published a monograph of 'Blankspace' and their projects. Andreas stopped his academic world trotting when, six years ago, his wife suddenly passed away: "I realized that as a single-dad to a baby girl, an academic career and its demand of total flexibility is not matching to the stability a child needs." So he became a registered architect in Vienna, still doing a bit of research and writing, "But mostly doing what I always also longed for: doing real architecture." He recently won a competition for a community center near Vienna, and placed second in a massive competition to fill a historic hole in the middle of Vienna – the old meat-packing district. In the proposal, he made good on combining living and industry: "It is the last free space in Vienna that has the potential to become a site not only for housing but also of production as well." As a now rooted globe trotter, Andreas misses "getting out of the city once in a while - traveling is something that produces an energy that you otherwise do not have," but, "Vienna is very cozy." Andreas believes strongly in bringing his conversations to the public, not just publishing books and in the Guardian, but also writing for the Augustin, the Viennese “Boulevard Paper,” sold by the local homeless to support themselves. Copyright © 2018 pulp, All rights reserved. pulp is an architectural circular. Our Comics Editor is Sarah Kasper.